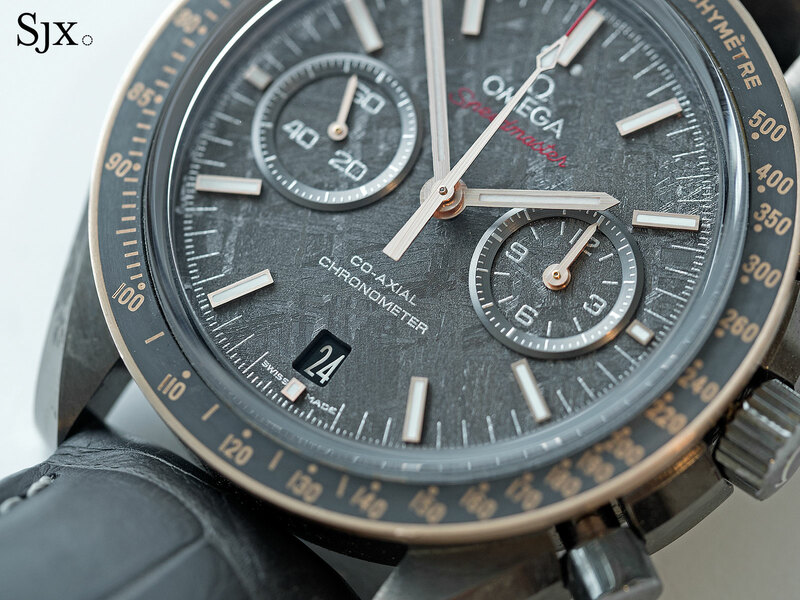 Explaining rocks from outer space, which is used for the dial of Omega's latest, high-spec Speedmaster in grey ceramic. Famous as the watch that went to the Moon, the Omega Speedmaster Professional remains part of NASA’s approved equipment for space. The Moonwatch is a no-frills, almost basic wristwatch, powered by the reliable but decades-old Lemania calibre 1872 (also known as the Omega calibre 1861). Since its tryst with destiny in 1969, the Moonwatch has steadily evolved, improved, and gotten a lot fancier. The Speedmaster Grey Side of the Moon “Meteorite” is one of the most elaborate variants to date, boasting a murderer’s row of features and innovations, inside and out – admittedly at a hefty price. 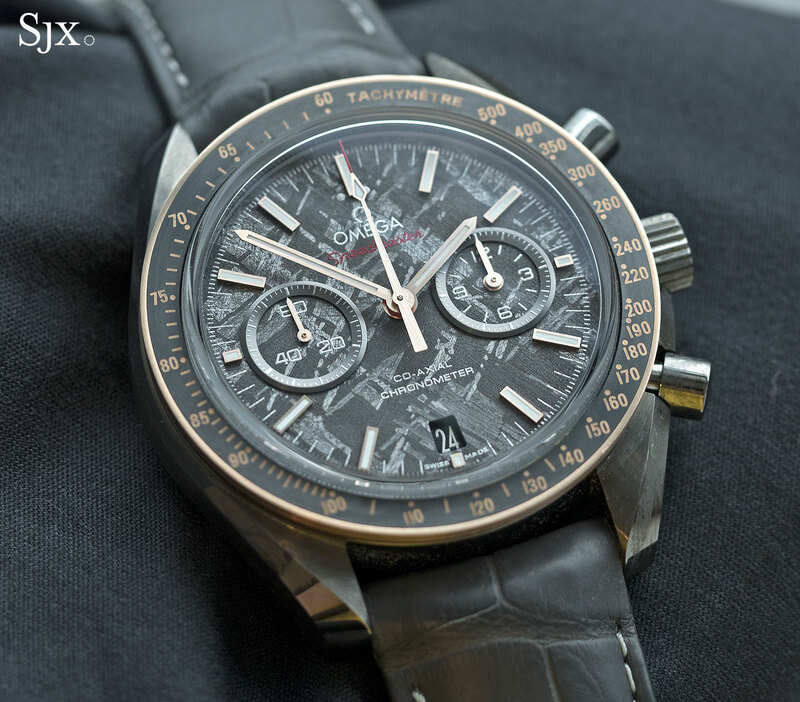 The meteorite Speedmaster is essentially a dressed up version of the ceramic Speedy that made it debut three years ago as the Speedmaster Dark Side of the Moon (DSOTM). 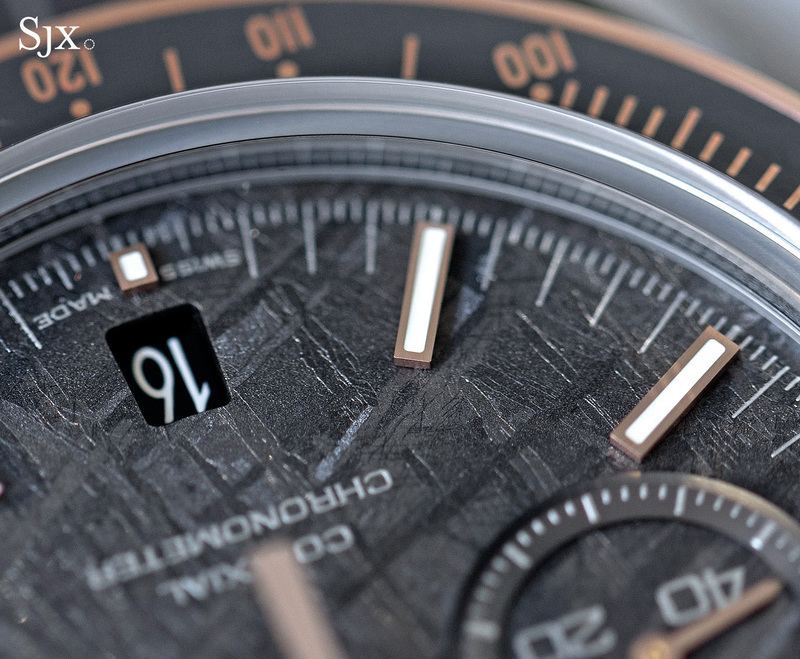 With almost all the external components made of ceramic – case, bezel, back, dial and even buckle – the DSOTM was an impressive feat of manufacturing technology. Since then the DSOTM has grown to include white, grey and all the shades in between, somewhat diluting the novelty of the product. The Speedmaster Grey Side of the Moon “Meteorite” brings back a tiny bit of the novelty with a meteorite dial. 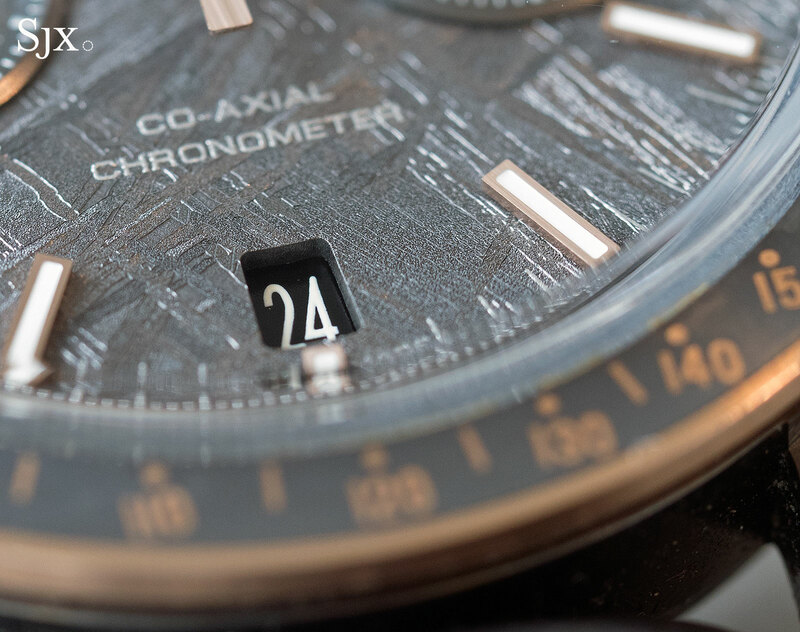 Distinguished by abstract striations that resemble Impressionist brushstrokes, meteorite is a fitting material for the Moonwatch, but the latest Speedmaster is not the first to have cosmic rock for the dial. 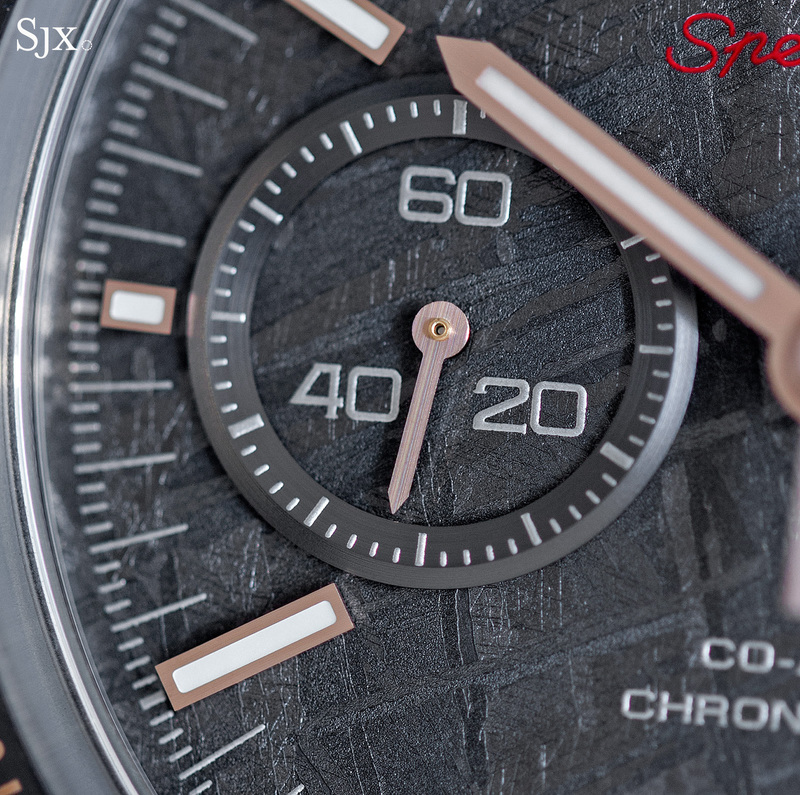 That distinction goes the Speedmaster Apollo-Soyuz 35th Anniversary (ref. 311.30.42.30.99.001) of 2010. Exotic as it sounds meteorite is not a rare material, since thousands of cosmic rocks have fallen to Earth. National Geographic says over 60,000 meteorites have been discovered on the planet, while according to Cornell’s Astronomy Department the mass of sizeable meteorites that hit Earth each year is in the thousands of kilograms – that’s several tonnes a year. Meteorites are either iron or stony, but iron meteorites are the inevitable choice for decorative objects, because of the attractive Widmanstätten pattern on the material. 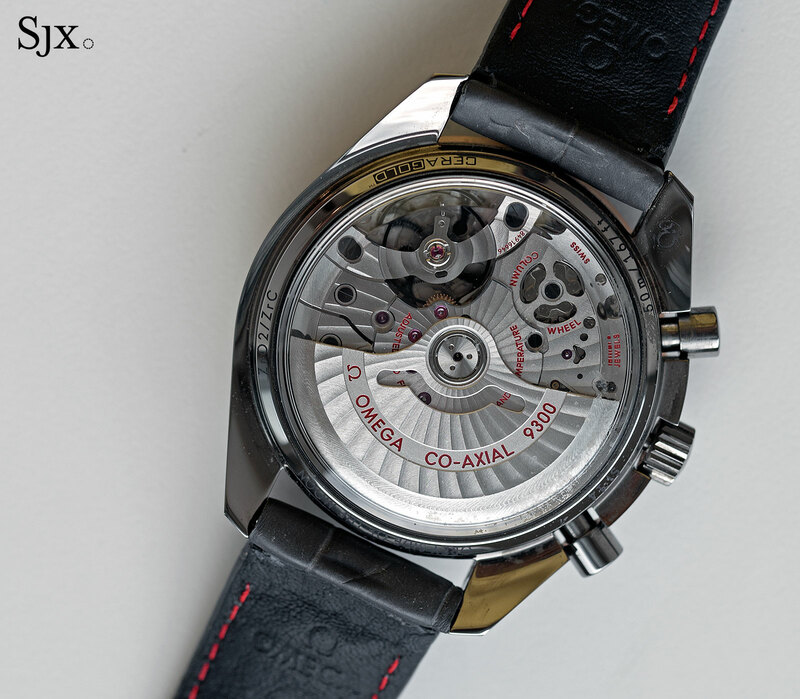 The material was first used for watch dials in the 1980s, with Corum being one of the first to do so. 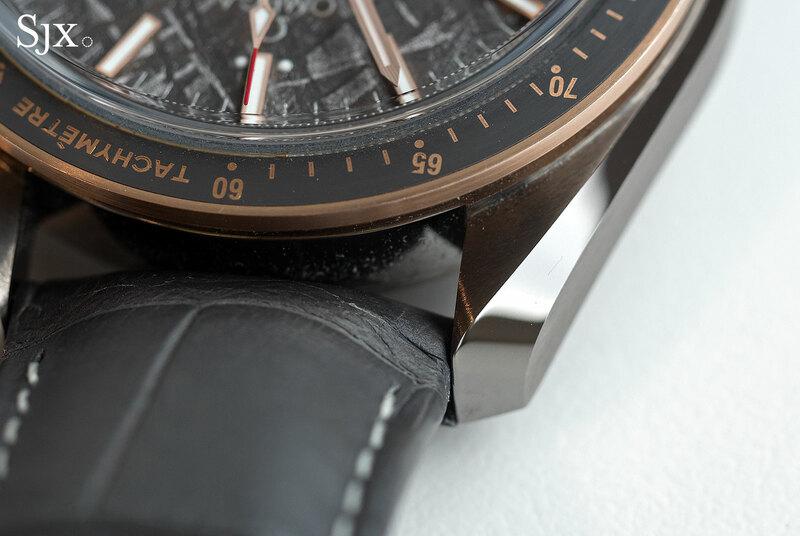 Since then meteorite, like many other fads in high-end watchmaking, has waxed and waned in popularity, being found on inexpensive watches, and also on last year’s Jaeger-LeCoultre Master Calendar Meteorite. While the material itself is abundant, turning meteorite into a watch dial requires some skill. 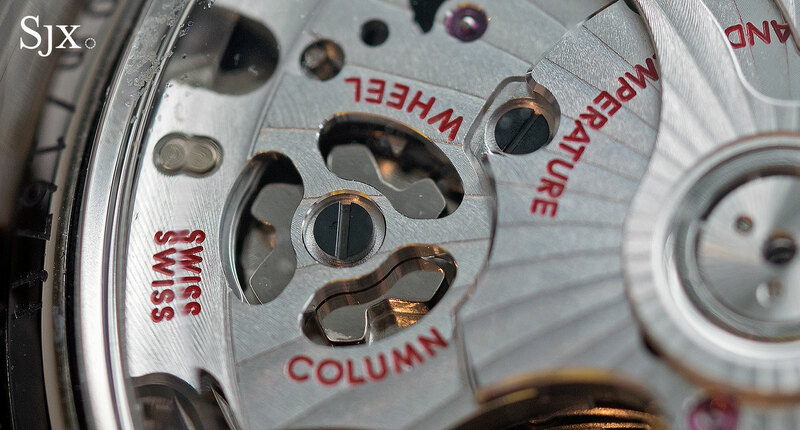 The rock is first cut into a tube, then sliced thinly to produce a dial disc that’s then polished. Being hard and delicate, the disc is prone to cracking, which makes it fortunate the material is not in short supply. An important process then follows: etching with acid (Nital, a mix of nitric acid and methanol) to highlight the distinctive Widmanstätten pattern of the material, something demonstrated in this Youtube clip. Irregular and characterised by geometric striations, the Widmanstätten pattern is the result of the nickel-iron crystals inside iron meteorite, which are basically giant chunks of iron. Such meteorites are mostly made up of kamacite and taenite, minerals composed of iron and nickel, which react differently to acid, bringing the Widmanstätten into greater relief. The broad, lighter coloured streaks are kamacite, the narrow, darker bands are taenite, while the smoother areas are plessite, a combination of the two minerals. The particular meteorite that supplied the material for Speedmaster Grey Side of the Moon the Gibeon, a massive rock that hit Earth in prehistoric times, fragmenting into thousands of pieces strewn over several hundred kilometres in modern day Namibia. Weighing some 26 tonnes (according to the Meteoritical Society, a non-profit that studies the cosmos and catalogues meteorites), the Gibeon was discovered in 1836 and has been the source of meteorite for jewellery since. 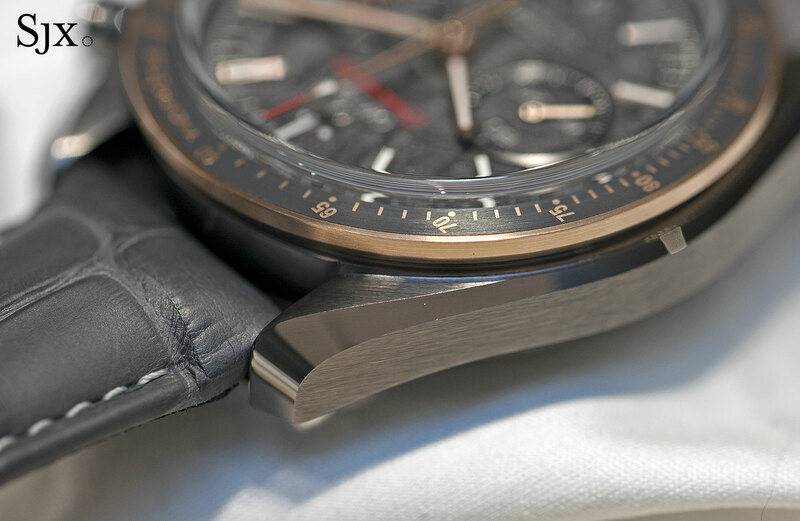 Aside from the dial, the Grey Side of the Moon “Meteorite” is identical to the various “Sides of the Moon” Speedmasters. The case is ceramic and 44.24mm in diameter, big enough it won’t be missed on the wrist. 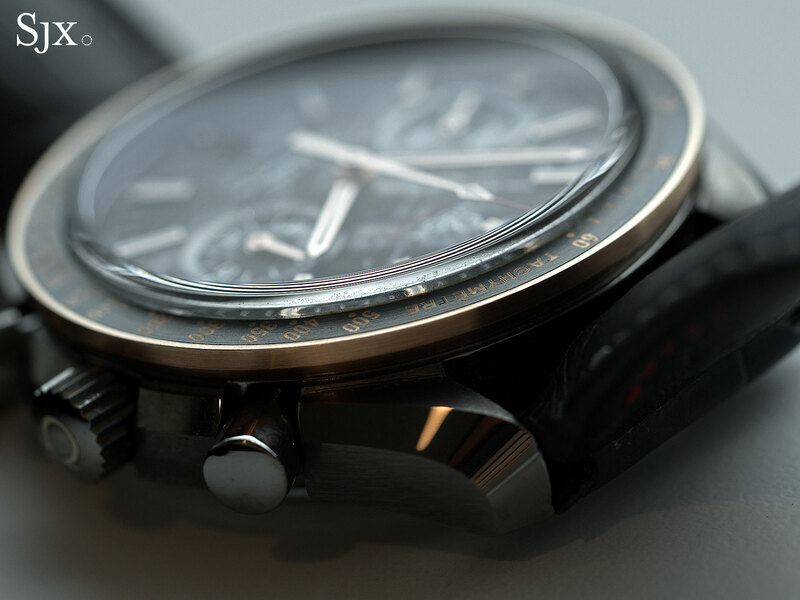 Unlike ceramic cases found in lower-priced watches that are uniformly glossy on all surfaces, the grey case of the Speedmaster is sintered, milled into shape and then polished. The result is a finish that resembles metal, with alternating brushed and polished surfaces intersected by neat borders. It looks good up close, revealing a precise finish that few can match; Audemars Piguet does with its ceramic Offshore watches that are perhaps superior in finishing, but much more expensive. 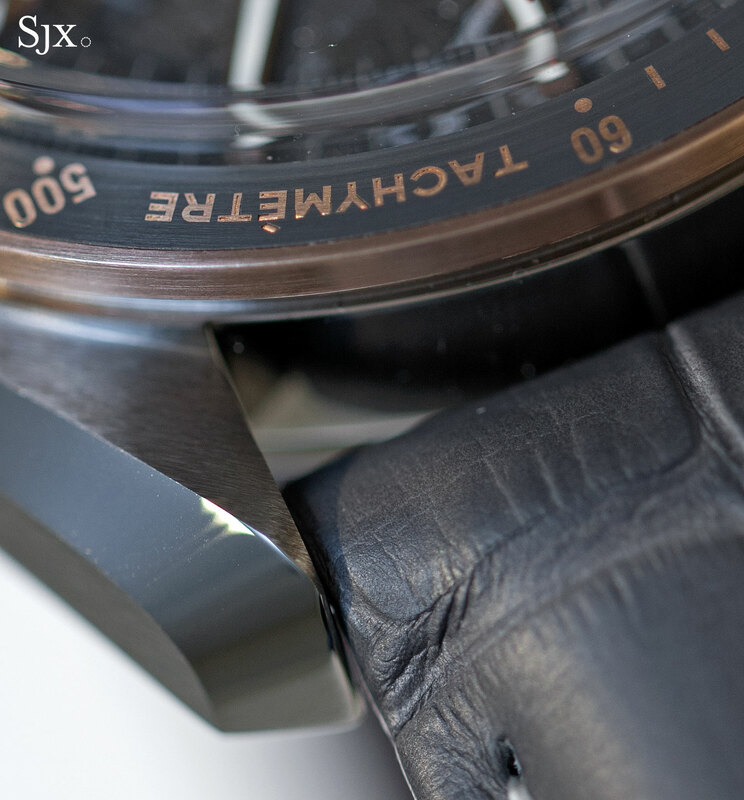 The sapphire crystal on the meteorite Speedmaster is a bit more elaborate than usual, with a “box-shape” form. Essentially a dome with a flat top and an angled edge, the box-shape sapphire crystal was historically found only on higher end timepieces or most notably, Grand Seiko, given the extra cost to produce, compared to a flat crystal. That being said, the advance of technology has made box-shaped crystal more common, even on watches like the accessibly priced Longines Heritage 1969. The bezel is 18k Sedna gold, Omega’s patented red gold alloy that never fades. Sedna gold is also used for the hands and applied hour markers, which give the dial contrast and an expensive air. Ordinary rose or pink gold tends to lose its rosy lustre over time as chlorine encountered in daily life (in tap water for instance) dissolves the copper molecules on the metal’s surface, taking away its pink colour. Sedna gold, on the other hand, is colour-fast thanks to the addition of palladium that protects the copper molecules. The Everose alloy that’s proprietary to Rolex relies on a similar formula, using platinum instead, to ensure permanent color. To get the grey filling on the bezel, it is first engraved to create relief lettering and then coated with silicon nitride, a hard, grey ceramic that’s also used to make the case of the featherweight Rado HyperChrome Ultra Light. Then the bezel is polished down to render the ceramic flush with the metal, creating a smooth surface. 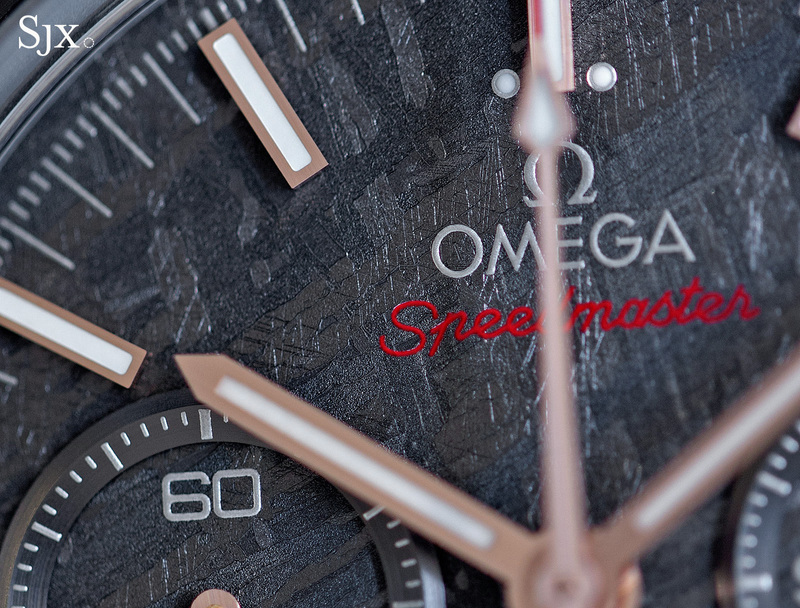 The Speedmaster meteorite is powered by the calibre 9300, one of Omega’s top of the line movements that’s put together in a high-tech facility in Grenchen, the hometown of movement giant ETA. It’s a large – large enough it almost fills up the 44mm case – fully featured chronograph movement with all the bells and whistles: column wheel, vertical clutch, silicon hairspring, and Co-Axial escapement. Like the rest of Omega’s high-end movements, it’s finished with Cotes de Arabesques, a spiral damascening on the bridges and rotor. All of the decoration is mechanically applied, but attractively and elaborately done. The only thing it is missing is the magnetism resistance of Omega’s latest generation of movements, the METAS-certified Master Co-Axial calibres that are unaffected by magnetic fields in excess of 15,000 Gauss, equivalent to some MRI machines. 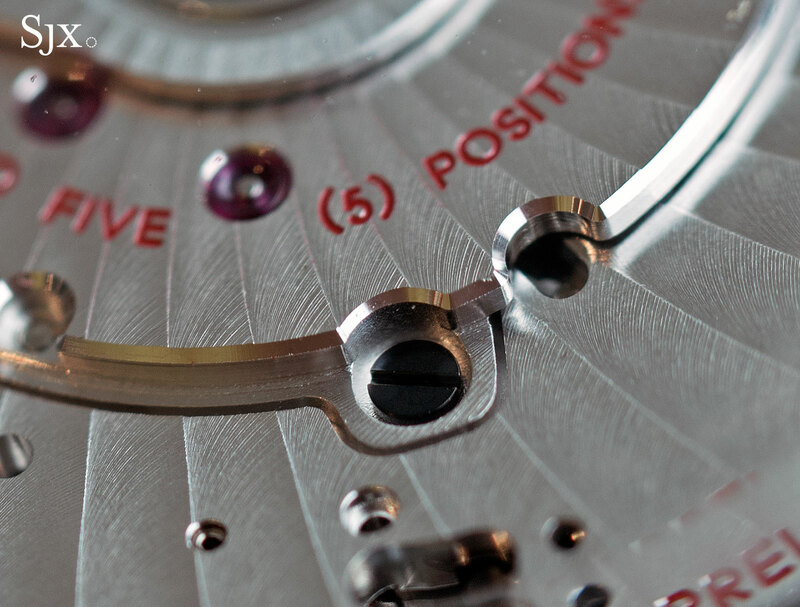 But that upgrade will surely come on the next generation of chronograph movements. Costing just under US$16,000, the Speedmaster Grey Side of the Moon “Meteorite” is a lot of movement relative to the average Omega. In fact, it’s about 25 per cent more expensive than the basic Dark Side of the Moon. 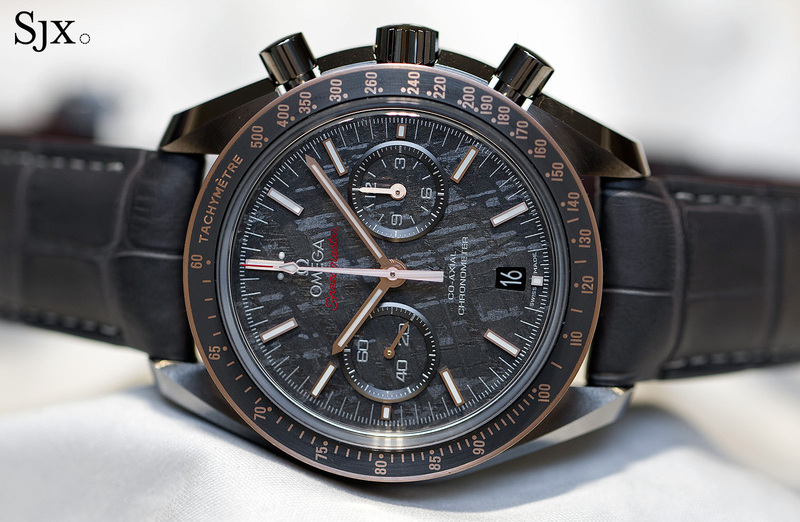 But on its own merits the Speedmaster Grey Side of the Moon “Meteorite” is a lot of watch for the money, literally. There is a lot in it, in terms of materials, movement features and even manufacturing quality. Available starting September 2016, the Speedmaster Grey Side of the Moon “Meteorite” (ref. 311.63.44.51.99.001) is priced at US$15,600, €12,800 or S$20,200. With the distinction of being the first Speedmaster with a ceramic case, the Omega Speedmaster Dark Side of the Moon is actually all - case, bezel, pushers, crown, dial and even the buckle - ceramic.